A major textile manufacturer placed a $446,000 order for eight Despatch TAD3-10 walk-in ovens. The sale was made by Despatch representative FLW Southeast. These ovens will be used to preheat spinnerets, so polymers will not stick as they are extruded through the tool. The heavy metal spinnerets weigh about 40 pounds and are heated to 600°F before use. Drawers were added to the ovens to allow tools to be easily removed when needed and placed back in the oven when they cool. The drawers used an existing design that features a heat shield to allow them to be opened with the oven at full temperature for a continuous process flow. 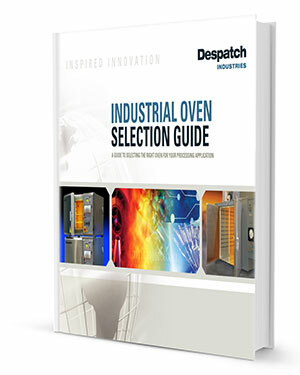 Despatch TAD walk-in ovens feature horizontal recirculating airflow to ensure uniform temperatures throughout the oven. A high-volume fan circulates air through perforated, aluminized steel walls to create a constant horizontal airflow across all sections of the oven. Multiple temperature operations are controlled by up to eight programs, with eight ramp and soak segments in each program.